In cities across the nation, a few enjoy rising affluence while many struggle to get by. This situation is created in part by the practices of traditional economic development. Current trends threaten to worsen, unless we can answer the design challenge before us. Can we create an economic system—beginning at the local level—that builds the wealth and prosperity of everyone? The cities profiled in this new Democracy Collaborative report show the way forward. Economic development professionals and mayors are working in partnership with foundations, anchor institutions, unions, community organizations, progressive business networks, workers, and community residents. What’s emerging is a systems approach to creating an inclusive, sustainable economy where all can thrive. The work is place-based, fed by the power of anchor institutions, and built on locally rooted and broadly held ownership. It’s about building community wealth. 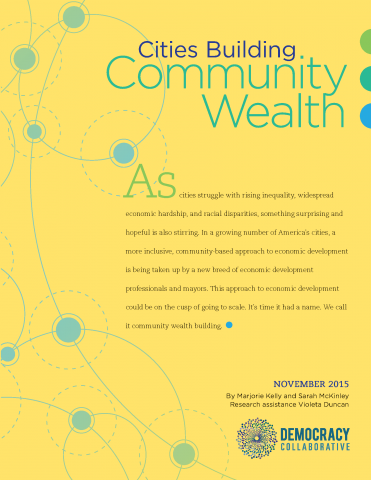 Cities Building Community Wealth is available as a free PDF download; if you'd like to order printed copies, either for yourself or to distribute to local elected officials and community stakeholders, click here (bulk rates available).